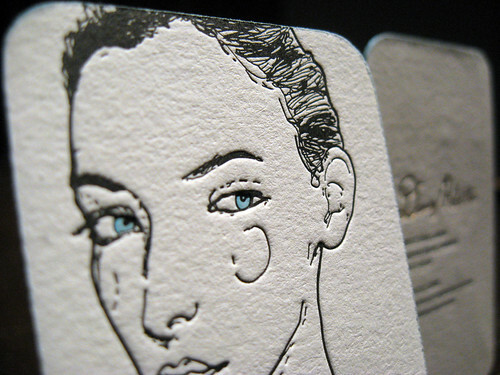 Letterpress/Foil business cards for artist Danny Roberts. We love to work with creative people! Artist Danny Roberts, better known as Igor+Andre, is an amazing illustrator. He truly has a unique vision of fashion and the world. If you want to see some of his work, check out his website (DannyRoberts.com). There was no doubt in our mind after speaking to Danny that we wanted the cards to feature his work. His business cards were letterpress printed on both sides using a black and light blue ink. We also added metallic gold foil to the front (the necklace) and on the back (his signature). The metallic foil is shiny and reflective, unlike the metallic ink we used on Machine Box’s cards. Additional finishing included rounded corners (1/4″ die) and edge coloring. The edge color was custom mixed to match the models blue eyes.